This building houses the lodge, the kitchen and the kitchen staffs living quarters. 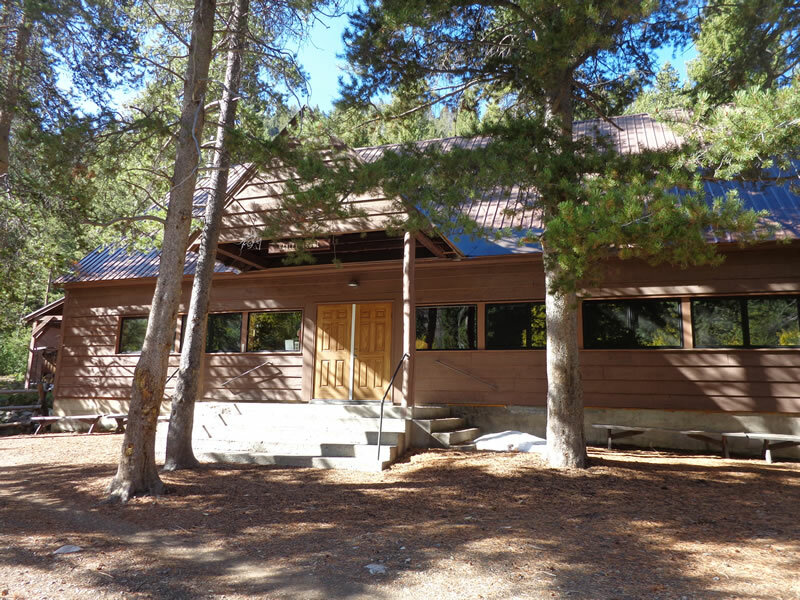 The lodge is approximately 30 X 65 feet and used as the dining hall, meeting room and a gathering place for large group activities. The focal point is a large river rock fireplace, which is the main heat source along with two wood burning stoves. (Split wood is located on the north east side of the building.) The south end of the lodge is a concrete floor with the north end being carpeted. The interior is open to the stud walls and ceiling rafters and is not insulated. The lodge is lit with a combination of fluorescent lighting, bulbs and spot lights. There is also access to electrical outlets. Tables with attached benches accommodate approximately 100 people. Approximately 80 folding chairs are also available. The exterior is wood siding with awning windows on the east and west sides. Stationary windows under the eaves on the north and south ends bring in additional light. To enter the east side of the lodge, walk up approximately 6 steps, to a covered porch and enter through double wide doors. Two single entrance doors to the lodge are located on the northwest and southwest ends of the building. The northwest side also has a patio area with bench seating and a single restroom. This same area is also adjacent to the kitchen and is often used for grilling.